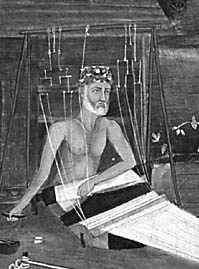 Kabir was a weaver and mystic poet who lived in Benares for 120 years. He was an important influence on the Hindus and Muslims [then called Mohammedans] of his time and also a profound influence on Guru Nanak, the founder of the Sikh religion. Many poems of Kabir can be found in the Guru Granth Sahib, the sacred scriptures that form the book that is the Guru of Sikhism. Kabir was frequently criticised for simply weaving; there are miracles associated with Kabir which illustrate that when one devotes mind, body and spirit in all actions, the Lord will go and complete what his devotee needs to do. There are very few examples of such actions by the Lord on behalf of his devotee – who lives and breathes and labours – for the Lord only.